Each cell in a living system may contain thousands of different proteins, each with a unique function. Their structures, like their functions, vary greatly. They are all, however, polymers of amino acids, arranged in a linear sequence (Figure 4.16a). The functions of proteins are very diverse because they are made up of are 20 different chemically distinct amino acids that form long chains, and the amino acids can be in any order. 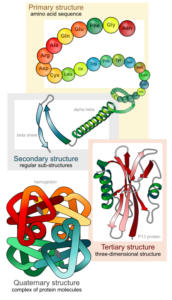 The function of the protein is dependent on the protein’s shape. The shape of a protein is determined by the order of the amino acids. Proteins are often hundreds of amino acids long and they can have very complex shapes because there are so many different possible orders for the 20 amino acids! Contrary to what you may believe, proteins are not typically used as a source of energy by cells. Protein from your diet is broken down into individual amino acids which are reassembled by your ribosomes into proteins that your cells need. Ribosomes do not produce energy. The information to produce a protein is encoded in the cell’s DNA. When a protein is produced, a copy of the DNA is made (called mRNA) and this copy is transported to a ribosome. Ribosomes read the information in the mRNA and use that information to assemble amino acids into a protein. 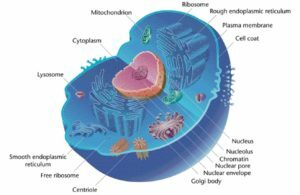 If the protein is going to be used within the cytoplasm of the cell, the ribosome creating the protein will be free-floating in the cytoplasm. If the protein is going to be targeted to the lysosome, become a component of the plasma membrane, or be secreted outside of the cell, the protein will be synthesized by a ribosome located on the rough endoplasmic reticulum (RER). After being synthesized, the protein will be carried in a vesicle from the RER to the cis face of the Golgi (the side facing the inside of the cell). As the protein moves through the Golgi, it can be modified. Once the final modified protein has been completed, it exits the Golgi in a vesicle that buds from the trans face. From there, the vesicle can be targeted to a lysosome or targeted to the plasma membrane. If the vesicle fuses with the plasma membrane, the protein will become part of the membrane or be ejected from the cell. Insulin is a protein hormone that is made by specific cells inside the pancreas called beta cells. When the beta cells sense that glucose (sugar) levels in the bloodstream are high, they produce insulin protein and secrete it outside of the cells into the bloodstream. Insulin signals cells to absorb sugar from the bloodstream. Cells can’t absorb sugar without insulin. 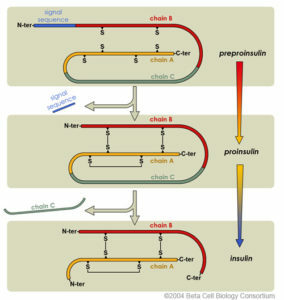 Insulin protein is first produced as an immature, inactive chain of amino acids (preproinsulin – See Figure 4). It contains a signal sequence that targets the immature protein to the rough endoplasmic reticulum, where it folds into the correct shape. The targeting sequence is then cut off of the amino acid chain to form proinsulin. This trimmed, folded protein is then shipped to the Golgi inside a vesicle. In the Golgi, more amino acids (chain C) are trimmed off of the protein to produce the final mature insulin. Mature insulin is stored inside special vesicles until a signal is received for it to be released into the bloodstream. FIgure 4 Insulin maturation. (Photo credit: Beta Cell Biology Consortium, Wikimedia. 2004. 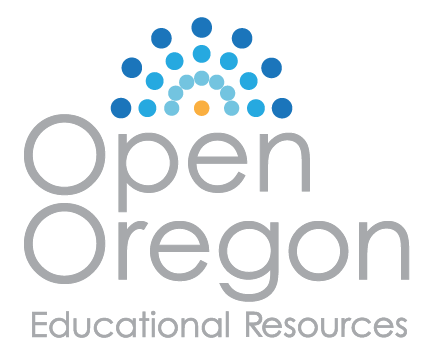 This picture is in the public domain.